Abu Bakar Bashir was born in 1938 in Indonesia’s East Java province to parents of Yemeni descent. Unlike Osama bin Laden he did not come from a family of distinction and did not receive a cosmopolitan education. He attended a well-known modernist Islamic boarding school, or pesantren, from 1959-1963 and graduated from the Al-Irsyad University in Central Java. Bashir began preaching at an early age. “Abu Bakar Bashir: Timeline of extremism.” ABC News (Australian Broadcasting Corporation), October 26, 2011, http://www.abc.net.au/news/2011-06-16/abu-bakar-bashir-timeline-of-extremism/2760374. He is currently serving a 15-year sentence for propagating terrorism, at the Pasir Putih prison in Nusakambangan, an island near the coast of Cilacap, Central Java. Nevertheless Bashir is able to meet regularly with associates including members of Jemaah Islamiyah.Witular, Rendi A. “Abu Bakar Ba’asyir calls on followers to support ISIL.” The Jakarta Post, July 14, 2014. http://www.thejakartapost.com/news/2014/07/14/abu-bakar-ba-asyir-calls-followers-support-isil.html. Bashir became one of the more prominent radicals, espousing strict sharia law in the 1970s. He has consistently preached that Islamic communities are a necessary precondition for establishment of an Islamic caliphate. “Profile: Abu Bakar Ba’asyir.” BBC News, June 11, 2011. http://www.bbc.com/news/world-asia-pacific-10912588. Together with Abdullah Sungkar, Bashir established an Islamic school, or madrasa, called Al-Mukmin in Ngruki, Central Java in 1972. “Profile: Abu Bakar Ba’asyir.” BBC News, June 11, 2011. http://www.bbc.com/news/world-asia-pacific-10912588. The school indoctrinated students with a disestablishment gospel, calling for the overthrow of the Indonesian government and the founding of an Islamic state under sharia law. As a result of perpetual inflammatory remarks against President Suharto’s regime and promotion of an Islamic state, Bashir was charged with subversion in the late 1970s. “Profile: Abu Bakar Ba’asyir.” BBC News, June 11, 2011, http://www.bbc.com/news/world-asia-pacific-10912588. Sungkar was also charged with infractions against the state and the two fled to Malaysia in 1985. During their exile in Malaysia, Bashir and Sungkar expanded their network of madrasas, sending students to training camps in Afghanistan and Mindanao in Southern Philippines. It is during this period of outreach and network building, that the basis for the Jemaah Islamiyah’s organization is developed. Following the fall of President Suharto in 1998, both returned to Indonesia to continue their campaign for a sharia state. Bashir has been in and out of jail for over four decades on charges of providing support for terrorism, inciting violence, and calling for the overthrow of the government and establishment of sharia law. The Indonesian government and judicial system have arguably exercised restraint in prosecuting Bashir. According to several sources, Indonesian authorities have been hesitant to prosecute the cleric to the fullest extent of the law for fear of angering Islamic extremists within the country. Onishi, Norimitsu. “Indonesia Sentences a Radical Cleric to 15 years.” New York Times, June 16, 2011, http://www.nytimes.com/2011/06/17/world/asia/17indonesia.html?_r=0. Though Bashir has been consistently denying any active involvement with Jemaah Islamiyah in the past decade, a majority of the 200 militants arrested after the Bali bombings pointed to Bashir as the propagator of the plan and as the ideological lighthouse of their jihad. JI members admitted that any significant operation required his approval, either in person or through the leadership council. Security Council Committee Pursuant to resolutions 1267 (1999) and 1989 (2011) concerning Al-Qaida and associated individuals and entities. “Narrative Summaries of Reasons for Listing: QI.B.217.06 Abu Bakar Ba’asyir.” April 8, 2011, http://www.un.org/sc/committees/1267/NSQI21706E.shtml. Even when imprisoned, Bashir continues to preach for establishment of sharia and a violent toppling of the Indonesian regime. In 2008, he established a new group, Jemaah Ansharut Tauhid (JAT), following a sermon in which he referred to tourists in Bali as “worms, snakes and maggots” and called for youth to seek martyrdom. “Abu Bakar Bashir: Timeline of extremism.” ABC News (Australian Broadcasting Corporation), October 26, 2011, http://www.abc.net.au/news/2011-06-16/abu-bakar-bashir-timeline-of-extremism/2760374. The establishment of JAT was apparently part of Bashir’s effort to distance himself from JI, most likely in an effort to dodge the actions of an Indonesian government that grew increasingly intolerant of the group. Most recently, in July 2014, while in prison he convened a group of high-ranking JAT leaders and family members, vocalizing his support for ISIL. Witular, Rendi A. “Abu Bakar Ba’asyir calls on followers to support ISIL.” The Jakarta Post, July 14, 2014, http://www.thejakartapost.com/news/2014/07/14/abu-bakar-ba-asyir-calls-followers-support-isil.html. On January 18, 2019, Indonesian President Joko Widodo announced that Bashir would be released early for humanitarian reasons but reversed his decision days later.Ninek Karmini, “Indonesia leader to free radical cleric behind Bali bombings,” Associated Press, January 18, 2009, https://apnews.com/e98a433cb091451fa0255a53c385f255. 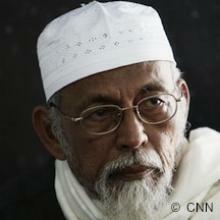 According to his lawyers, Bashir refused to fulfill the condition of pledging loyalty to the Republic of Indonesia and Pancasila, the official state ideology.“Indonesia cancels early release for Abu Bakar Bashir, radical cleric linked to Bali bombings,” Channel NewsAsia, January 23, 2019, https://www.channelnewsasia.com/news/asia/indonesia-abu-bakar-bashir-early-release-cancelled-bali-bombings-11157000. Abu Bakar Ba'asyir"Profile: Abu Bakar Ba'asyir," BBC News, June 16, 2011, http://www.bbc.com/news/world-asia-pacific-10912588. Abu Bakar Baasyir“Security Council Al-Qaida Sanctions Committee Amends One Entry on Its Sanctions List,” United Nations, October 14, 2015, https://www.un.org/press/en/2015/sc12082.doc.htm. Abdus Samad“Security Council Al-Qaida Sanctions Committee Amends One Entry on Its Sanctions List,” United Nations, October 14, 2015, https://www.un.org/press/en/2015/sc12082.doc.htm. Abdus Soma“Security Council Al-Qaida Sanctions Committee Amends One Entry on Its Sanctions List,” United Nations, October 14, 2015, https://www.un.org/press/en/2015/sc12082.doc.htm. The U.S. Department of State designated Jemaah Islamiyah as a Foreign Terrorist Organization (under Section 219 of the Immigration and Nationality Act) and a Specially Designated Global Terrorist (under Executive Order 13224) on October 23, 2002. Freeze of assets in U.S. financial institutions; ban on admission of members to U.S.; ban on providing “material support or resources” to entity.“Foreign Terrorist Organizations,” U.S. Department of State, https://www.state.gov/j/ct/rls/other/des/123085.htm; “Snow Announces Designation of 10 Jemaah Islamiyah (JI) Terorrists,” U.S. Department of the Treasury, September 5, 2003, https://www.treasury.gov/press-center/press-releases/Pages/js700.aspx. The U.S. Department of the Treasury designated Abu Bakar Ba’asyir (under Executive Order 13224) on April 13, 2006. Blocks all property in U.S. or under possession of control of U.S. persons; bans any property-related transactions by U.S. persons or within U.S., including giving or receiving contributions to the entity.“Treasury Designated Four Leaders of Terrorist Group – Jemaah Islamiyah,” U.S. Department of the Treasury, April 13, 2016, https://www.treasury.gov/press-center/press-releases/Pages/js4179.aspx. The U.S. Department of States designated Jemaah Ansharut Tauhid, established by Bashir in 2008, as a Foreign Terrorist Organization (under Section 219 of the Immigration and Nationality Act) on February 23, 2012.“Terrorist Designations of Jemaah Anshorut Tauhid,” U.S. Department for State, February 23, 2012, https://www.state.gov/j/ct/rls/other/des/266619.htm. The United Nations listed Abu Bakar Bashir as an individual associated with the al-Qaeda Network on April 21, 2006.“Security Council Al-Qaida Sanctions Committee Amends One Entry on Its Sanctions List,” United Nations, October 14, 2015, https://www.un.org/press/en/2015/sc12082.doc.htm. Abu Bakar Bashir was born in 1938 in Indonesia’s East Java province to parents of Yemeni descent.